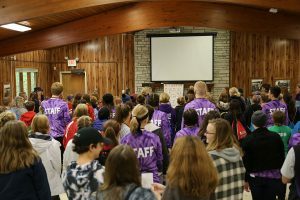 On October 6th and 7th, over 150 participants came together for a weekend to celebrate the arts in many of its forms during Arts Camp at Upham Woods. Youth rotated through six unique arts tracks taught by 4-H arts counselors. From culinary arts with pancake art to drama games in theater arts and sticker making in digital arts, there was something fun for everyone! Participants were able to experience every track with a group of other 4-Her’s in grades 6-8 from around the state. The goal is for participants to return to their local communities and 4-H clubs with a renewed passion for the arts that they will share with others. Looking for more information on Arts Camp? Check out the Arts Camp Website https://fyi.extension.wisc.edu/wi4harts/arts-camp/. We hope to see you at Arts Camp in 2019!